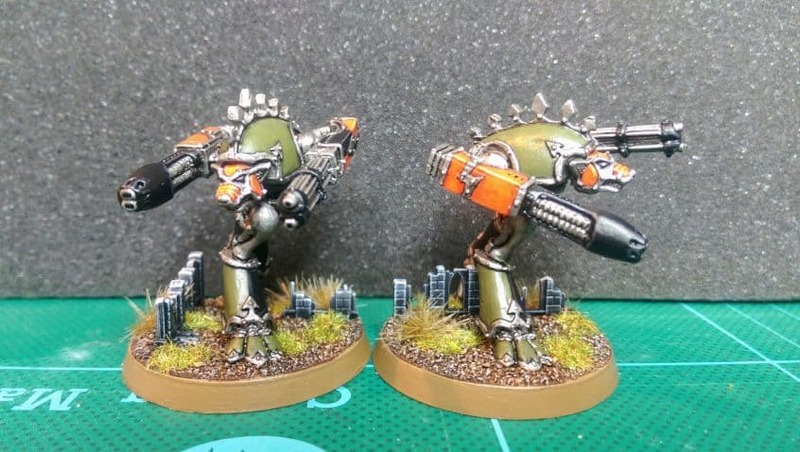 Painted and ready for action — a pair of Warhound titans, to support my Imperial forces in Epic Armageddon. I might add a few more highlights and/or a little more detail later, but for now I’m calling these ‘done’. They cost a lot more, even at eBay prices (and I already have enough of the old models just waiting for some paint). Their much greater size makes them more of a hassle to store and transport (one of the nice things about Epic is how little space you need to store an entire army). The models look impressive, but their greater surface area and level of detail means that they’ll take longer to paint (I just want to get my titans painted and looking decent for play). While their size is more ‘realistic’ relative to Epic infantry, I prefer to be consistent with the old titan/gargant models that exist for a range of armies. The old models are likely to remain more common in Epic armies for a long time to come. Plus, to date there are no new models for the titans of the Eldar and other races so I couldn’t be consistent between my own armies. Besides, I actually still have a soft spot the old titan models! I plan to follow up with a couple of Reaver titans soon, and eventually a couple of Warlord titans.